Song for VanDyke is about Katie's experience as a volunteer foster parent for her first guide dog puppy, VanDyke - a toasted marshmellow colored male Labrador Retriever. While Katie had recorded other vocal tracks, it wasn't until the day she received notice that VanDyke would be officially graduating that Katie re-sung both the vocal lead and harmony tracks which you hear in this final production. A BIG Thank You to Ethan Winer who's musical talents can be heard twinkling on the strings of the lead guitar, rythym guitar and cello tracks. Ethan was also instrumental shaping the final mix (and yes, pun slightly intended). But I knew you could go on to do great things. And show the way to possibilities. Verse:	You were such a gift to raise. We gave you love and lots of praise. But you gave us so much more in return. And in letting go, there is so much we've learned. Bridge:	You're a true companion. You're a wise and trusting friend. You're a leeader 'round each bend. 10/31/2006 Katie and Chuck! I just listened to Song for VanDyke and can hardly type this through the tears. How beautiful! Have you approached anyone at GEB about letting you sing/play it on Saturday? I hope they say yes. It will be such a beautiful gift for his new partner. Congratulations again on the wonderful job that you did loving your yellow boy and giving him the best start possible! You should all be so proud! 10/31/2006 WOW, that is just wonderful. I didn't know that Katie sang or was so talented... Congratulations to you both for the wonderful job you did in raising him. 11/06/2006 Katie, ... It was so beautiful! Gregg wants you to come and perform here - we didn't know you had such a great voice! (And both Gregg and I agree about the picture - definitely an album, I mean CD cover shot!) Can I send your note about your web-site so everyone can check it out? 11/06/2006 Hey, Long time no see! OMG what a great song, both the lyrics and the singer! I'm not even going to mention the photo on the website! We should get you to sing up here, it would be great. Congrats on such a good job with VanDyke you should be proud. 11/15/2006 I loved the VanDyke song. It's beautiful. The actual dog is probably pretty cool too. What a nice thing to do. I know going into it you were aware the dog was going to a partner so that tempered the giving away part ... but wasn't it hard to say goodbye to the pup??? ... my compliments on the music and vocals. 12/06/2006 Katie, Finally had a chance to listen to VanDyke's song. Brought tears to my eyes ... it's so beautiful. And you have the voice of an angel. 12/15/2006 Katie's gentle song brought a tear to my eyes. You two have been blessed with such talent. I'm glad to know you. 12/19/2006 Wow! I love the rest of the story, and your website is really great. The "Song for VanDyke" is a wonderfully loving tribute, and what a ridiculously adorable puppy. That's amazing. On a side note, the Christmas Song is excellent as well. 05/15/2007 Nice melody, vocal and performance is top notch as always. What I like is the gentle sentiment here. Words of heart felt emotion in a mixed up world seeing is believing and believing that a dog can help get you there is cool... so is this song... thanks for sharing. 05/19/2007 I love this song ! This captures so much of the heart . Guding Eyes for the Blind Puppy Raising is such a joyous experience ! The bit of sadness we experience in letting go is overcome with so much pride and excitement knowing what prayers are about to be answered for someone who will receive this remarkable dog . The beauty of watching these incredible dogs blossom into as you say in your song ,"Champions and Leaders around each bend " , is a life changing experience . Thank you to all involved in creating this song . God Bless You . 03/12/2010 I love the song, and after meeting VanDyke I can understand the feelings that went into the song, what a wonderful dog he is. 03/28/2010 Katie, I felt the love and wonder in the words, the music. In giving you a gift, VanDyke also gave the REST of us a gift by inspiring your song! 09/26/2010 That is a beautiful song!!!!! 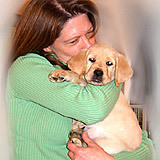 01/22/2012 Dear Katie---thank you for such a moving song that gives voice to what's in the heart of every puppy-raiser. VanDyke was a special puppy for a special raiser. Thank you. Privacy & Terms . All rights reserved. Site by The Avanti Group, Inc.